Have you been thinking about quitting tobacco?' If you are or if you know someone who is...we have something for you! The Spanish word "tabaco" is thought to have its origin in the Taino language spoken by the people of Tobago Isle, of the Caribbean. In Taino, it was said to refer either to a roll of tobacco leaves, or to the tabago, a kind of Y-shaped pipe for sniffing tobacco smoke. It started off as what meant to be for recreational use but later became very popular as a medicinal plant, almost panacea. Today, the tobacco industry is one of the biggest with over 5.5 trillion cigarettes smoked by over 1 billion people each year! People smoke/chew tobacco and find it difficult to quit because nicotine is addictive and they become ‘habituated'. 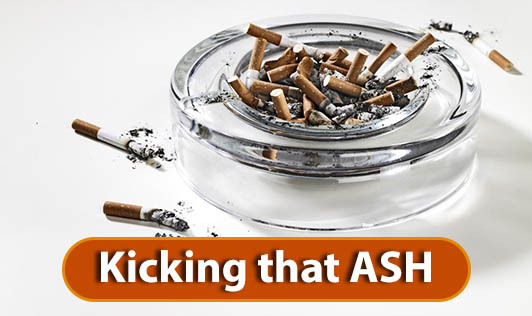 If you're looking for some motivation to stop smoking, or have just quit and need to build your resolve to keep going, use the facts in this article to fuel the fire in your belly to kick this destructive habit, once and for all. Second hand smoke is only from vehicle emission? No! Your smoking affects your family's health as well. Addiction shows up as physical (discomfort when not using tobacco), psychological (craving for tobacco) and behavioral (habit of using first thing in the morning). In India, 900,000 people die due to tobacco related diseases per year. Decide to quit and get ready to stop! The first step is to list all the reasons why you want to continue smoking. Then, list all the reasons why you want to quit. Maintain a diary of feedback for yourself. Record every instance you take tobacco, with the time of day. This will give you an idea of the number of times and places (any triggers) when you take and when you are most likely to miss your tobacco. You can then plan exactly how you will deal with the above situations when you stop using tobacco. Fix a quit date for yourself. Mark a specific day on your calendar so you can prepare for it. Don't delay too long. Remember, the present time is the best time. Choose an easy date when you won't be under much pressure. Tell your family and friends about the quit date so that they can provide support. Gradually start tapering off the number of cigarettes and set your quit date 2-3 weeks after that. Progressive reduction: Every day cut down one or more cigarettes/ beedis /Packet of gutkha/ khaini. Buy only the number of cigarettes/ beedis/ packets that you plan to smoke/ chew each day. After you've quit, you may develop cravings. Your cravings will be strongest in the first weeks. Delay acting on the urge to smoke/chew. Remind yourself that cravings are temporary. Take a deep breath through your nose and blow out slowly through your mouth, repeat 10 times. If most of your friends are smokers, avoid taking your coffee breaks with them if you feel it might tempt you. When planning for an evening out, choose places that have no smoking zones. Challenge negative thoughts - ‘I can't make it'/ ‘one usage will not be harmful'. Remember how hard you worked to stop. Morning tea/coffee will not taste the same without tobacco for sometime. Expect the desire to use tobacco after meals. Expect the urge to reach for tobacco when driving a car. Change your waking up schedule. Go for a brief walk after meals. Turn your radio on in the car. Switch on to non-alcoholic, non-caffeine drinks during the first two weeks of withdrawal, especially fruit juices. Think of non-tobacco rewards when you are relaxing: take time to read a book, listen to music, or call a friend. Reward yourself: Keep a list of things you want to buy with the money saved from not using tobacco. To cope with stress- practice meditation, take a shower, spend time with family, go for a walk, watch a funny movie. Chewing gum also helps when you're craving for tobacco. "When faced with a challenge, look for a way, not a way out"